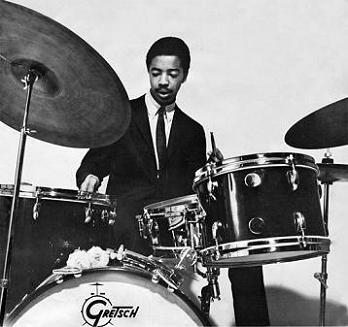 Tony Williams (1945-1997), operated the transition between bebop and fusion, by joining the Miles Davis quintet in 1962 (replacing "Philly" Joe Jones), at 17 years old (he already took part in jam sessions at 15) which evidences an exceptional precociousness. Miles Davis said he had to get back to work his instrument because of him. He is one of the first masters of improvisation with the four limbs, of the three limbs roll and the playing with strokes alternating (wrist-finger, especially for a devastating fast bop chabada with one handed roll). Tony turned to a more funky and Latin playing (binary, already present in the "fast bop") since the first "fusion" albums of Miles Davis (first funky piece: "Stuff" album "Miles in the Sky ", 1968). You should know that from the beginning, Tony was a fan of Ringo Starr, who influenced his playing, even in a bebop context (subtle swing, rim shots, ghost notes, violent breaks in single stroke rolls, flams, alternated with bass drum, etc.). The influence of the Jimi Hendrix Experience (with Mitch Mitchell on drumset, 1967) for this "jazz rock" orientation was surely decisive as evidenced by interviews with Miles Davis and his desire aborted by the untimely death of Jimi, to play with him. 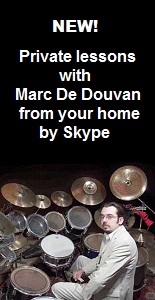 As Elvin Jones or John Bonham at the same time (1960, 1970), Tony marks a turning point in the approach to drumset, which reached levels of melodic and polyrhythmic complexity, and playing speeds, almost unsurpassable and on an altogether different scale from what was made before them (except perhaps by Buddy Rich, who also initiated the "jazz and rock” mixing on drumset with" Swingin' New Big Band" in 1966, with the cover of a Stevie Wonder hit of the same year: "Up-Tight").